Would you recommend 500 Hunters to a friend? @bentossell @chrismessina Haha, was gonna say it all started with a tweet and here it is :) Breaking down it down by year would be a cool new view, what do you think about that @dylanfeltus? @mubashariqbal @chrismessina @dylanfeltus haha! Yeah and then maybe even by month for new hunters wanting to see how they stack up too! 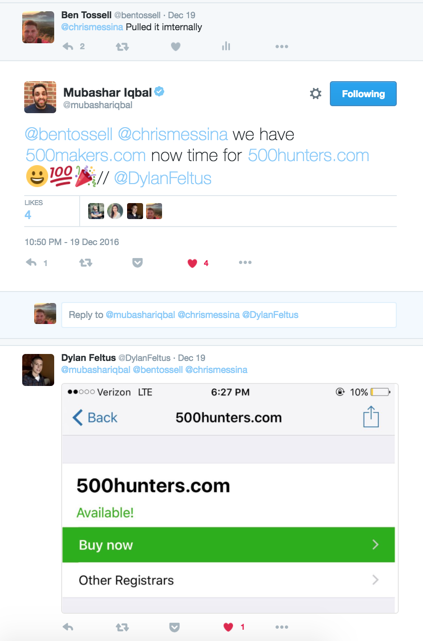 500 Hunters is a list of the top Hunters on Product Hunt, updated once a day. You can choose to sort the list by number of products hunted or by total number of votes. You can also see the Latest Hunters that have added products. @erictwillis Is it based on total number of products submitted? Or some other metric? @erictwillis Thanks for the hunt Eric! @miriamschwab The list is based on featured, not just total submitted products. The initial view is based solely on the number of products featured, and there are additional options to view by the number of votes on those products, and to be able to see latest hunters. @erictwillis This is an awesome product! Thanks for the hunt @erictwillis. I wrote a little bit about the story behind 500 Hunters: https://medium.com/@mubashariqba... Some people have already shared their thoughts 👍 , but if the do have any suggestions to improve 500 Hunters, or 500 Makers would love to hear them! I'd love to see a filter showing "hunt quality," # of hunts vs upvotes by ratio. @benln That sounds like a good addition to the sort options! I'm concerned that the relationship between "# of hunts vs upvotes by ratio" and "hunt quality" is spurious and misleading @mubashariqbal @benln. Perhaps a more literal description of what the data is actually gathering will be more accurate and useful. Where can I find a 'Product Hunt Consultant'?